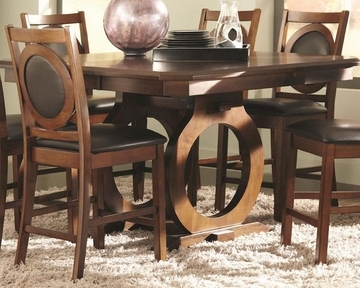 The St. John dining collection provides a stunning look for your dining room. With unique circular cut out designs on the table base and chair backs, these pieces are sure to catch your eye. Perfect for any occasion from casual weeknight meals to holiday parties, the St. John dining collection is the number one choice for contemporary dining spaces. For a bold and alluring dining experience, sit down at the Counter Height Dining Table. Made from wood veneers and solids and completed with a beautiful oak finish, this piece is sturdy and warm. 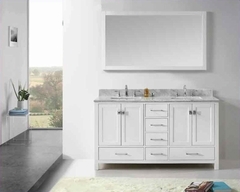 The rectangular top incorporates a chamfer edge with squared corners. Meanwhile, the double pedestal base has large circular cut outs, adding character and eye-catching design. This piece also includes a 12" leaf to extend the table longer. To complete the look, sit down at the counter Height Dining Side Chairs.